This week my Texas girlfriends have been sharing their homes, porches, and gardens. Have you seen their posts? This is such a wonderful group of talented and supportive friends led by Katie at Let's Add Sprinkles. I'm proud to join them today with peeks of our kitchen and a delicious classic fresh apple cake recipe. That's a lot of adjectives but seriously...it's that good. You all have seen my kitchen before. 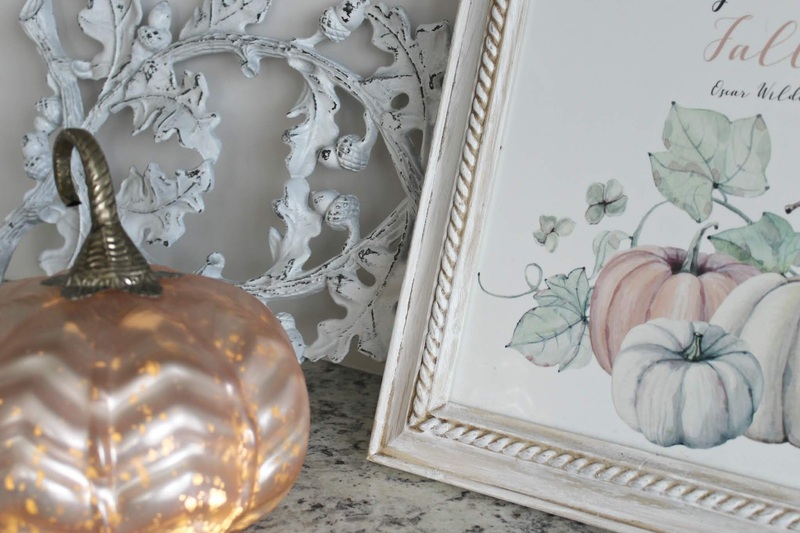 Today I'm just sharing a few fall touches that we've been enjoying lately. Grab a cup of coffee and let's walk over to the eating area. Our floor plan is very open and people usually seem to notice the open shelves in our kitchen eating area first. It's a funny thing, I notice on blogs and in comments that many people aren't sure they could do open shelves. But when people come into our house the shelves are something they love! As I've said before, this was a cost saving measure that turned out so great when we were building. We have plenty of storage space so I'm able to use this strictly as a fun area most of the time. It sure is nice to serve over here when we have company though. 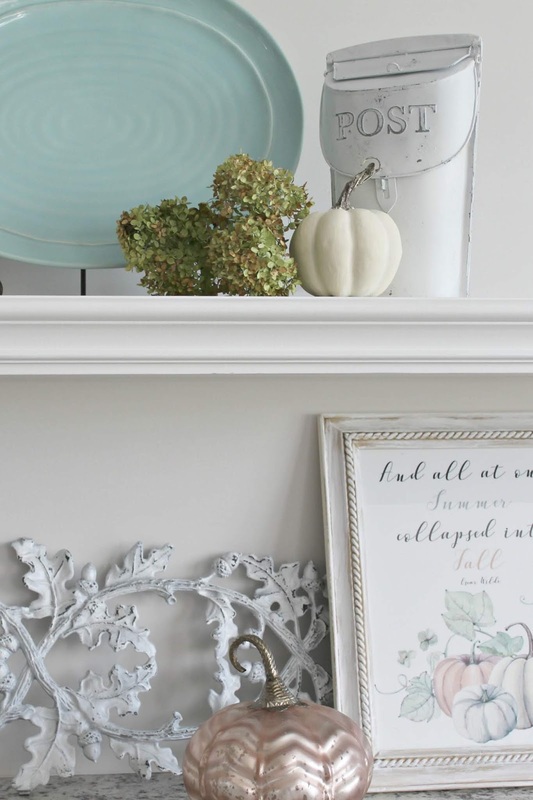 For a few simple fall touches in this area, I've added dried hydrangeas, a pumpkin or two, and faux Dusty Miller. Hold on a moment, while I'm showing you around let's have a slice of fresh apple cake. It's heavenly! You have to grab the recipe and try this. Now back to the kitchen... Isn't that metal fragment with acorns and leaves cool? Not sure if that's old or not but I bought it at an antique place. 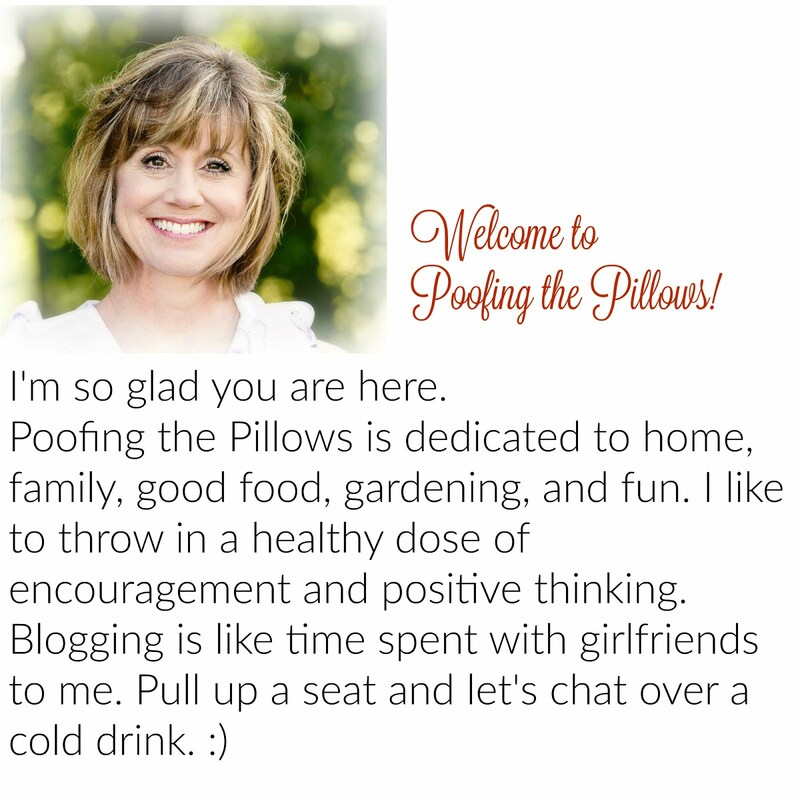 The pretty printable came from Maryann at Domestically Speaking. I think it's so pretty and fits in with our colors perfectly. I'm so glad you came to my kitchen today. I want to share this recipe with you for Fresh Apple Cake. With complete disclosure, I want you to know that this is a combination of two Paula Deen recipes. I have always loved Paula's recipes and when the urge for apple cake hit, I knew where to look. I took what seemed perfect from Grandgirl's Fresh Apple Cake and Uncle Bob's Fresh Apple Cake to make this moist, delicious cake. Right click to save and print. Thank you for visiting with me today and every other day. I very much appreciate that you come here and I love it when you comment. Be sure to keep going with the Texas gals by clicking on any of the links below. How lovely!! Well, I'd like to jus sit right down with you in your kitchen for a pie of that scrumptious apple cake!! Adore the colors! I might try your cake recipe this weekend, sounds delish, and we just picked 30 lbs of apples the other day! Good Morning Stacey. You have pretty and Yum in your post this morning. I love seeing your pretty fall kitchen. Using the lighter colors is so great to see. That cake looks pretty yummy too. Have a great rest of the week. Such a lovely tour Stacey! I adore your bookpage wreath and can't wait to try your apple cake. 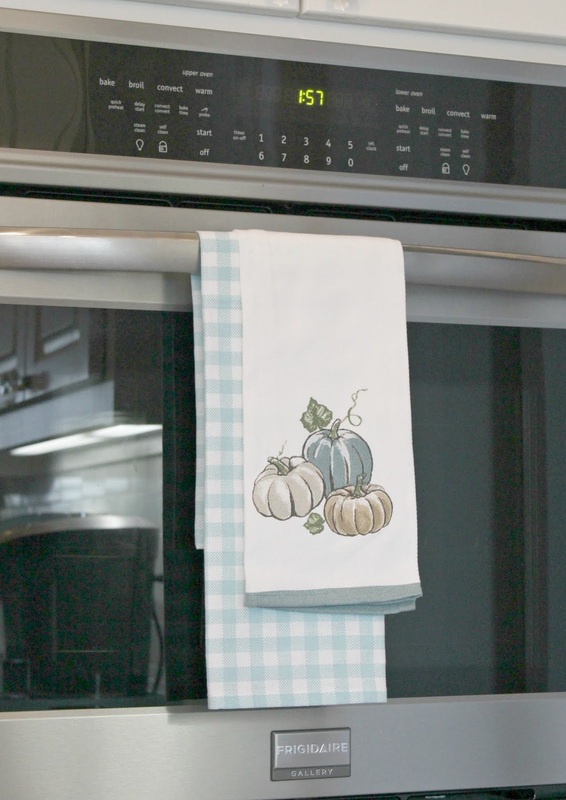 What wonderful Fall touches you have in your beautiful kitchen, Stacey! Your leaf wreath looks so pretty, and all your colors are so soothing and calming. Yes please, I'd love a big slice of your apple cake before I go. 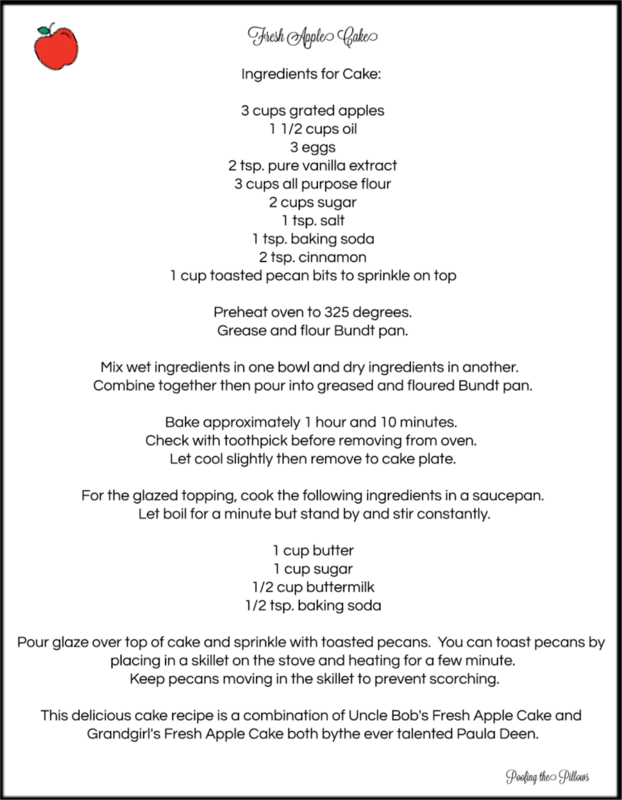 This sounds like another great recipe for me to use with my seasonal cakelet bundt pan. Thank you for sharing and for the tour! Happy Fall! What a beautiful place to eat a slice of apple cake! Your soft fall touches are so calming. Love your kitchen,always so pretty and that cake looks amazing. Thanks for the recipe, I will have to make this one. I adore apple cake. I love your kitchen. It's so light, bright and pretty. Your colors are just too pretty. Thanks for being a stop on our tour. I love your kitchen and it looks great dressed for fall. That cake sounds wonderful! Your colors are just perfect in your gorgeous kitchen and I LOVE open shelving. Your home always looks lovely Stacey, your style is always so fresh, clean and relaxing...and your cake sounds delicious! 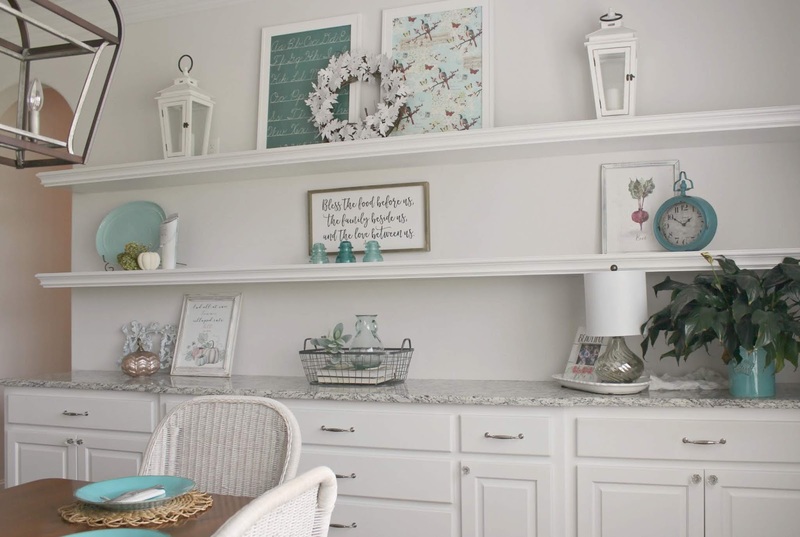 Stacey, your kitchen is so beautiful and I love the way you have styled your open shelving! Now if you could just send over a slice of apple cake, please. Just lovely Stacey, my home needs a new look. One day!! Well if this turns out to be duplicate comment then I am sorry. I am still having trouble commenting on my google account. I have tried everything. I love the shelves and the colors AND that metal thingie with the acorns. I missed the table runner post the other day. I am catching up now and I love it too. It is sad that we get all hung up by the other things we see and feel ours isn't as good because half the fun is coming up with things of our own. I love it! I am so glad to now have this recipe. I do love Apple Cake! Thank you for listening to my crazy thinking! Oh, my! 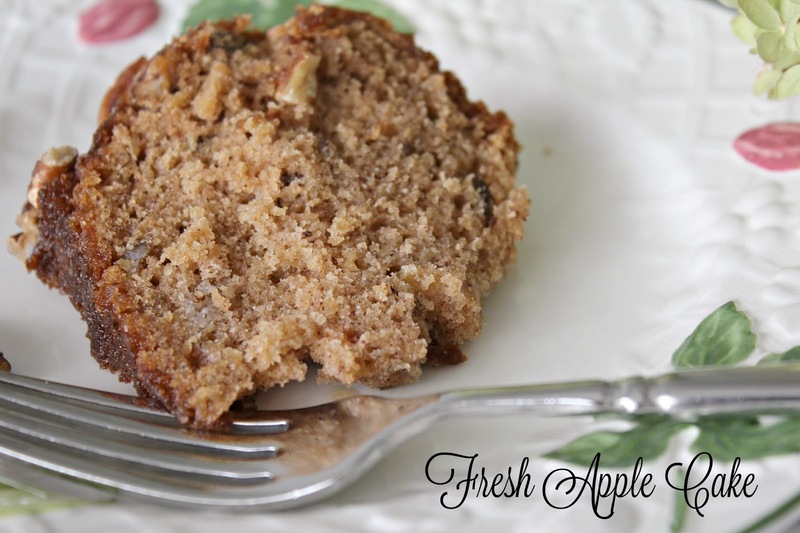 Fresh apple cake sounds delicious! Love the touches of blue throughout your kitchen. Lovely! I absolutely love your kitchen decor, Stacey! The colors are so soothing, pretty and clean. The open shelves in the kitchen look wonderful! 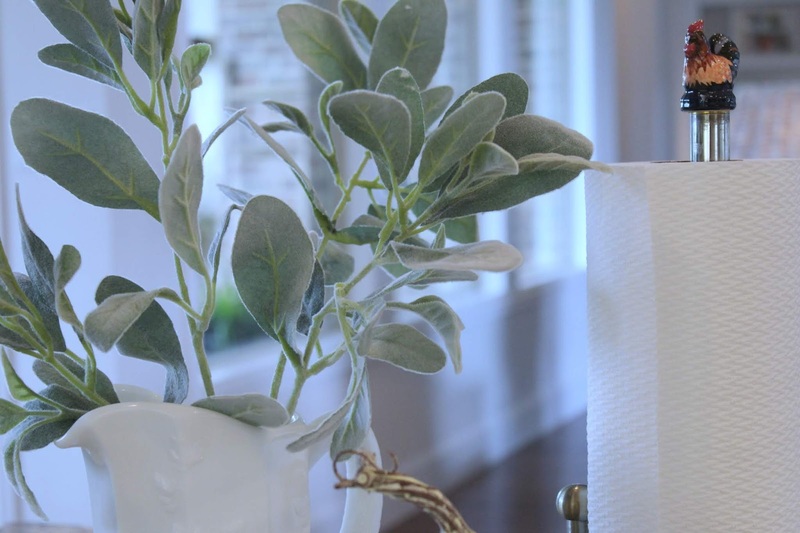 You definitely have mastered the art of adding just the right amount of decor. I struggle with that sometimes. 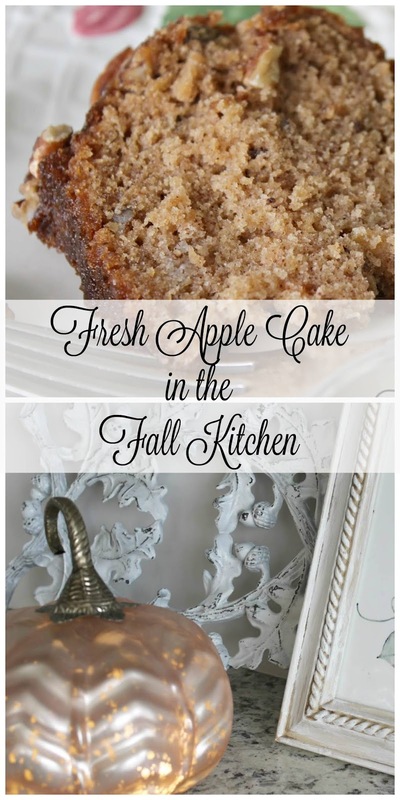 That apple cake recipe is going on my fall food Pinterest board! Yum! You're always so sweet and supportive. I'm glad to have shared this tour with you! I like your soft pastel fall decorating. Love the cute towels on the over door. The apple cake looks and sounds delicious! I used to be addicted to chocolate, now I love any pies, or muffins with apple or berries. Your Apple Cake recipe looks like it will be so yummy. Gives me an excuse to use my Mom's old bundt pan too. The reason everyone loves your open shelving is because you have them styled to perfection AND you have plenty of storage space. Your kitchen is gorgeous, Stacey! Ahhh and that cake! I would love to bake it. Thanks for sharing your recipe! I love all your fall touches and the recipe - can't wait to try it! 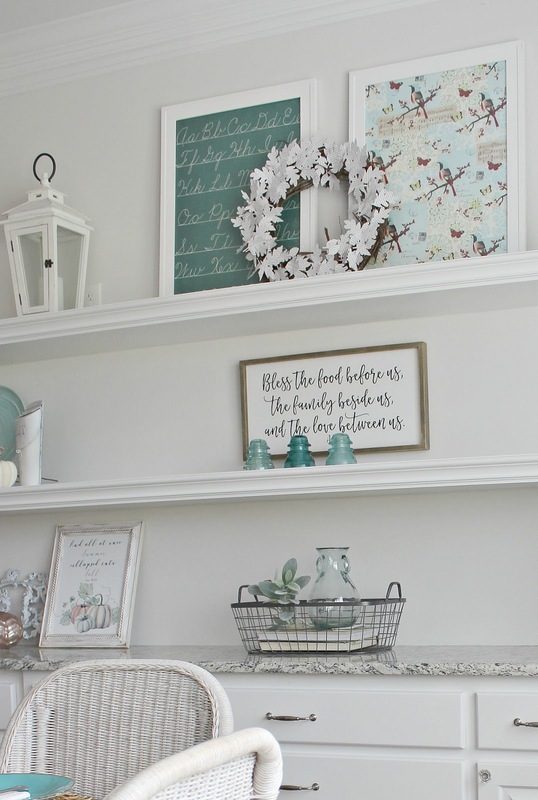 I love the way you styled your white shelves and the aqua is so fun! Your kitchen looks so beautiful and peaceful. I am drooling all over my computer looking at that cake. Have a wonderful week, Stacey. Love your kitchen! I've made fresh apple cake in the past, similar to your recipe, but mine had a buttercream frosting. This makes me want to make one again. Fall is in the air.